A child’s social and emotional development not only impacts his or her ability to achieve academically, it also influences many key areas of functioning beyond school. 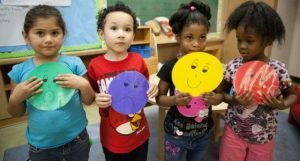 The mission of the Social and Emotional Learning Workgroup is to organize and provide resources to develop the social and emotional skills essential for the lifelong success of Norwalk’s children and families. As a team of service providers, practitioners and leaders from the district and community-based organizations, we strive to create a continuum of enrichment and intervention services and to create alignment between community and school district services in order to maximize available resources.